An almond biscuit, or almond cookie, is a type of biscuit that is made with almonds. They are a common biscuit in many different cuisines, and take many forms. 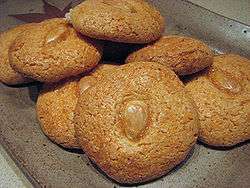 Types of almond biscuits include almond macaroons, Spanish almendrados, qurabiya (a shortbread biscuit made with almonds), and Turkish acıbadem kurabiyesi. In addition, Turkish şekerpare are often decorated with an almond. In Norway, sandkakers are a type of almond cookie that are baked in fluted tins. A Chinese almond biscuit (or cookie) is a type of Chinese pastry that is made with ground almonds. The biscuit is one of the most standard pastries in Canton, Hong Kong, Macau, and in some overseas Chinese bakeries. They are small, containing no filling. In addition, they are very crumbly. In Macau, the snack has been one of the most popular specialty products. Especially near the Ruins of the Cathedral of St. Paul, streets are packed with 10 to 20 stores, all selling different flavors of almond biscuits next to one another. Hawkers line up on the street to push the merchandise. It is recommended on the official Macau tourism website as a famous Macanese snack. Koi Kei is one of the famous brands of almond cookies from Macau. 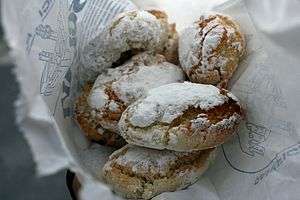 Ricciarelli are a Tuscan almond biscuit. 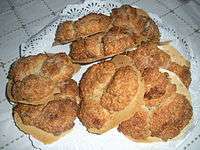 Almendrados are a type of almond biscuit in Spanish cuisine. Acibadem kurabiyesi is an almond biscuit in Turkish cuisine. "Chinese almond biscuits" (Chinese: 杏仁餅; pinyin: xìng rén bǐng; Jyutping: hang6 jan beng2) are common in Cantonese cuisine. ↑ "Chinese Almond Cookie Recipe". The Nibble Great Food Finds. Retrieved 6 January 2014. 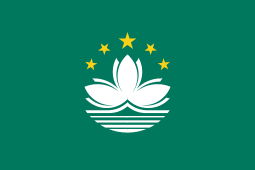 ↑ Macau.com "Where To Eat, What To Eat in Macau"